Archipelago. I love that word. While it can mean any group of islands close to each other I frequently hear it used to describe many islands that carry great diving opportunities. In the eastern Pacific Ocean we have the Galapagos Archipelago off Ecuador, and off the tip of Baja, the Archipelago Islas de Revillagigedo (try saying that one with marbles in your mouth) and, in our neck of the woods, I have often heard the Channel Islands described as an archipelago. A lot of the geographic terms that are used regarding bodies of water can be a bit confusing. The goal of this article is to ease some of that confusion by offering a simple primer on ocean lingo. First off let’s make clear that the designation of specific bodies of water can be arbitrary. In some cases, they’re regional names. Years ago when I was working the oilfields as a commercial diver I was assigned to a job in the Persian Gulf. Before departure we were given a full briefing on etiquette of the region. The Persian Gulf is bordered by Iran (ancient Persia) to the north and several Arab countries to the south. Because we were working out of the United Arab Emirates (UAE) in the south we were told, in no uncertain terms, to refer to this body of water only as the Arabian Gulf. Other unusual naming examples include the Dead Sea in Israel and the Salton Sea in the southern California desert. These bodies of water are quite different than, for example, the North Sea off Scotland or the Red Sea in Egypt. The true designation of a “sea” rather than another name is that a sea is a large body of water at least somewhat bordered by landmasses, be it islands and/or continents. The Caribbean Sea, for example, borders on Central and South America but is also bordered by the islands of the Greater and Lesser Antilles to the north and east respectively. Another sea famous for diving opportunities closer to home is the Sea of Cortez just south of California in Mexico. The Sea of Cortez just south of the border also has the designation as the Gulf of California. The title of “Gulf” is usually reserved for an exceptionally large body of water mostly surrounded by the nearby continent. The Gulf of Mexico is an excellent example. To muddy the waters further, the Gulf of California (a.k.a. Sea of Cortez) is part of the Pacific and the Gulf of Mexico is part of the Atlantic as is the Caribbean Sea. With the exception of seas being an inland body of water ­­­— used especially for names of such bodies (like the Salton Sea), seas and gulfs are always part of the greater bodies of water, the oceans. Saline water covers 140 million square miles of Planet Earth – approximately 71 percent of its surface and 90 percent of Earth’s biosphere. The World Ocean (or Great Ocean) contains 97 percent of the earth’s water — and by the way, oceanographers estimate that only 5 percent of it has been explored. Oceans are the largest bodies of water on the planet. The five oceans that make up the World Ocean are, from smallest to largest, the Arctic, Southern (Antarctic), Indian, Atlantic and Pacific. The Arctic is sometimes considered a sea of the Atlantic, yet it is quite large at 5.427 million square miles. Many think its frozen appearance (most of its surface is solid ice) means it is a landmass like the continent of Antarctica. While the Arctic Ocean is indeed very cold it is most definitely an ocean. It is bordered by Europe, Asia and North America. The Southern (Antarctic) Ocean encircles Antarctica. It is sometimes considered an extension of the Pacific, Atlantic and Indian Oceans. South of India is the Indian Ocean. It is the next largest ocean on the planet at 27.24 million square miles. It is bordered by the continents of Africa, Asia, Australia, and, to the south, Antarctica. For divers, it’s most famous diving is found along the coral atolls of the Maldives. The Atlantic Ocean is the second largest in size at 41.4 million square miles. The most popular diving areas in the Atlantic Ocean are in the Caribbean Sea. The second largest barrier reef in the world is that which extends through the popular diving areas of Cozumel, Mexico and offshore from Belize. Another popular diving area in the Atlantic close to Florida is the Bahamas. The coral reefs off Florida make up the world’s third largest barrier reef. In the ranking of ocean sizes, the Pacific is by far the largest. The Pacific Ocean separates Asia and Oceania from the Americas. It is not only the largest ocean on the planet at 62.46 million square miles, it is also the largest physical feature on Earth. All continents of the world, including Greenland, could fit into the Pacific Ocean. And we Californians are privileged to live along just such a beautiful and bountiful body of water. Oceans are bordered by three or more continents and are fringed by smaller, adjoining bodies of water such as seas, gulfs, bays, bights and straights. Let’s continue this primer on ocean lingo using what we know in our local waters. Most of the California Pacific coastline runs roughly in a north-south direction. But at Point Conception at the north end of Santa Barbara County the coastline takes a radical turn to an east-west orientation. As the coast curves around heading south it once again positions itself in a north-south direction. This curved part of the Southern California coastline that runs from Point Conception to San Diego is known as the California Bight. A bight is a long sweeping curved area of a coast that offers some degree of protection from the winds and seas. The California Bight area includes the Channel Islands and part of the Pacific Ocean. This is significant for divers in that the prevailing weather comes in from the northwest. Consequently, the islands and coastline within the California Bight area generally calmer than those located to the northwest and along the outer edge. Bays are a bit more enclosed. A bay is a recessed, coastal body of water that directly connects to a larger main body of water, such as an ocean or another bay. 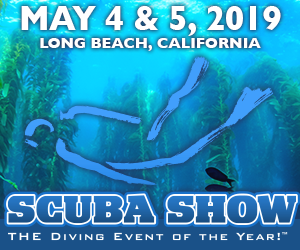 The bays that are of most interest to sport divers along the California coast are Monterey Bay and nearby Carmel Bay in Central California and the Santa Monica Bay bordered by Malibu to the north and the Palos Verdes Peninsula to the south. This bay is within the Southern California Bight area, consequently these waters are well protected both by the bay itself as well as being within the bight. Even so, the Santa Monica Bay can have its rough days. 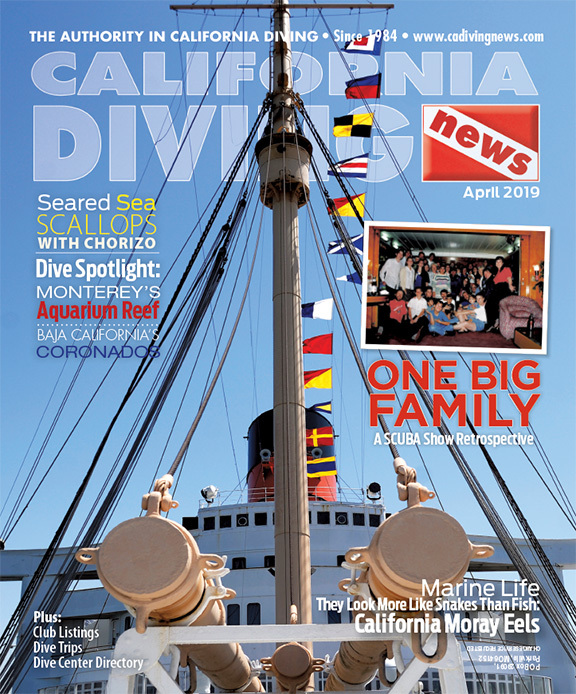 The Monterey and Carmel Bays are also somewhat protected by the surrounding landmasses, and these bays can have some excellent diving throughout much of the year because of their calmness. Just as with the Santa Monica Bay, however, they can have their bad days. A cove is a type of smaller bay with a circular inlet and narrow entrance, and we have a lot of them along the coast and around the islands. Coves offer an even more protected area of water. 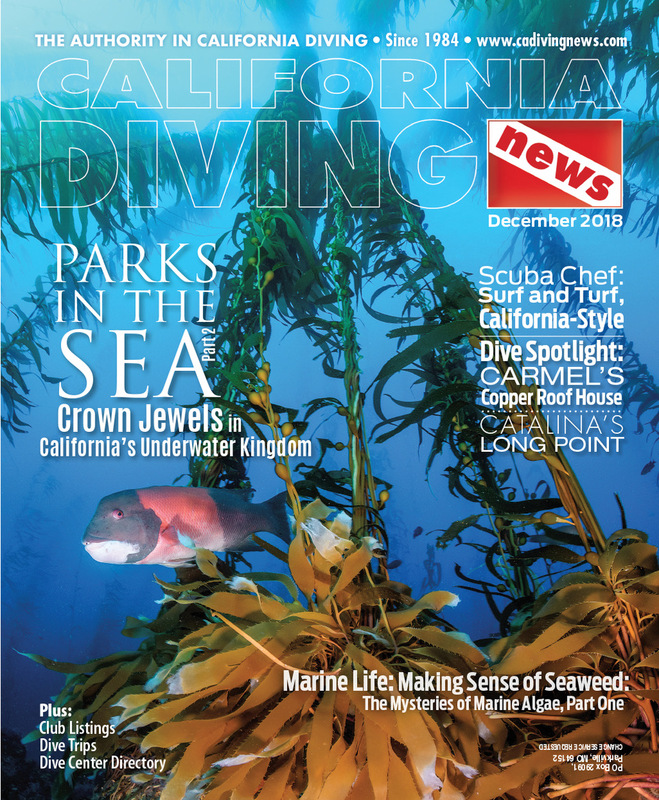 A favorite of San Diego sport divers is La Jolla Cove off San Diego. Off Orange County are numerous good coves for diving including, but not limited to, Woods, Divers and Shaw’s Coves. And in L.A. County, check out Malaga Cove. On nautical charts you frequently see the name given to underwater features like shoal or bank or reef. Just what is the difference? Often these names are somewhat arbitrary (especially when it comes to east vs. west coast), but here are some general rules: A shoal is an expansive area of relatively shallow water (sometimes considered a hazard to navigation) that rises from the bed of a body of water to near the surface. Often it refers to submerged ridges, banks, or bars that rise near enough to the surface to be considered a potential hazard to navigation. 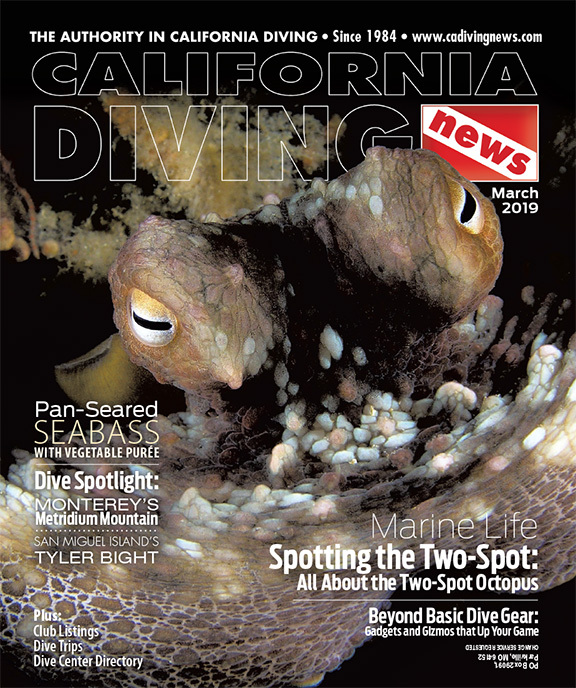 Talcott Shoal is our only diving related example in California. Located on the north side of Santa Rosa Island near the west end, this is a big area that spans many square miles. The bottom at Talcott consists of gently sloping shale, with undercuts in the exposed shale ledges that run roughly north-south throughout the area with occasional piles of boulders scattered in the shallows. A bank is a smaller shallow area. In ocean nautical terms it is a relatively flat rise in the ocean floor forming somewhat of a plateau. Examples in the Channel Islands include the famous Farnsworth Bank 1.6 miles off the backside of Catalina. Another example, favored by underwater hunters, especially those in pursuit of lobster, is Cortes Bank. Cortes Bank is way, way out at 96 miles. It is rarely visited in spite of its spectacular diving. These two banks, by the way, are noteworthy in that they are far from shore and bathed in clear ocean currents making the diving rivaling any exotic tropical destination. Finally, a reef refers to any underwater feature with a natural hard substrate, be it rock or coral. Reefs are many but, in my experience, quite individual in nature, not just in structure but also in marine life, often related to the profile of the reef. Looking over a nautical chart, whether in electronic form or on old-fashioned paper, can be interesting, exciting and perplexing all at the same time. Knowing a bit of lingo will help you prepare to head out to sea and enjoy all sorts of underwater adventures.